Traditional Chinese Medicine (TCM) has been around for thousands of years. The Chinese believed that energy (or Qi, pronounced "chee") flows through the body in predictable patterns. Certain points along these pathways could affect the Qi dynamic and balance and harmonize the energy flow throughout the body. In essence, that is what acupuncture — even in its modern form — strives to do. A typical acupuncture treatment uses between four and ten needles (though acupuncture for facial rejuvenation can use 24-30). The needles used in our office are Seirin brand needles from Japan. These come individually packaged and are pre-sterilized. 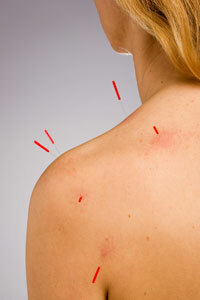 The needles are tiny, and most of the time, you don't feel anything when they are inserted. Once all of the needles required for treatment are inserted, they remain in place for 28 minutes, during which time many of our patients take the opportunity for a quick nap. For those who are a bit squeamish at the sight of needles, we also offer a completely painless, needle-free laser acupuncture. Using a focused beam of light, we stimulate an acupuncture point for a period of time, generally between 20 seconds and 2 minutes, depending on the desired goals of treatment.